Traditional Swiss Belts: Hand-crafted in the Appenzell region of Switzerland. Decorated with Brass or Silver cows and herdsmen or with horse designs. We measure in inches from the buckle to the	middle hole. Belts available in Black, Red, Brown, Blue, Green and Tan. Call for available sizes and colors in stock. Please allow 6 to 8 weeks for special orders extra shipping charge on special orders. Measurements for belts are made from the buckle to the middle hole for sizes listed below. Please measure your waist and order accordingly. 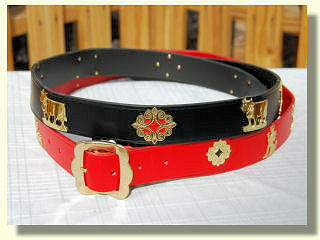 Traditional Swiss Belt 1¼ inches wide comes with Brass cows and herdsmen. Contrasting underlay for black, red, and tan only. Sizes 24, 25, 27, 29, 31, 33, 35, 37, 39, 41, 43, 45 , 47, 49 inches. Please specify with or without underlay. Traditional Swiss Belt in Silver 1¼ inches wide comes with Silver cows and herdsmen. Available in black only with contrasting red underlay.Sizes 24, 25, 27, 29, 31, 33, 35, 37, 39, 41, 43, 45 , 47, 49 inches. 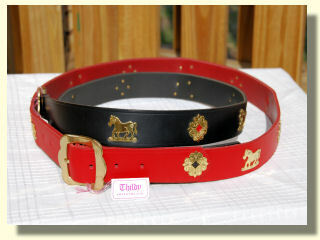 Swiss Horse Belt 1¼ inches wide available only with Brass horses. Contrasting underlay for black, red, and tan only. Sizes 24, 25, 27, 29, 31, 33, 35, 37, 39, 41, 43, 45, 47, 49 inches. Please specify with or without underlay. 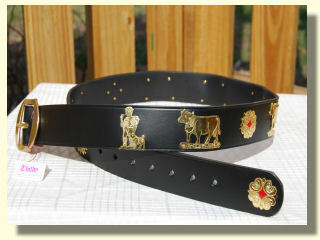 Wide Traditional Swiss Belt in Brass 1½ inches wide available with Brass cows and herdsmen. Contrasting underlay for black, red, and tan only. Sizes 24, 25, 27, 29, 31, 33, 35, 37, 39, 41, 43, 45, 47, 49 inches. 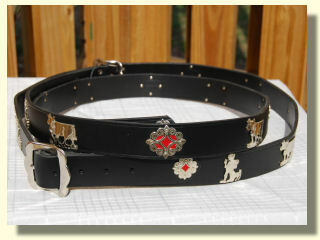 Wide Traditional Swiss Belts in Silver 1½ inches comes with Silver cows and herdsmen. Available in black only with contrasting red underlay.Sizes 24, 25, 27, 29, 31, 33, 35, 37, 39, 41, 43, 45,47,49 inches.